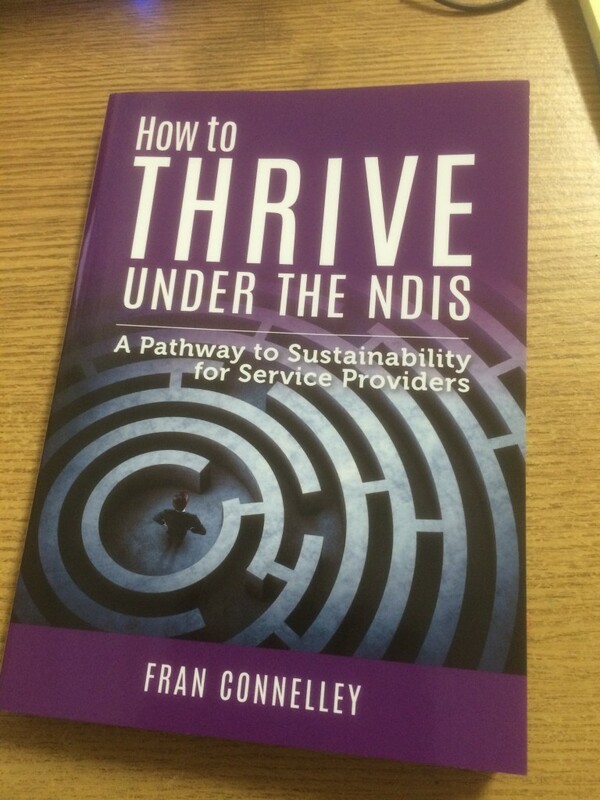 I was excited to receive a parcel from Australia this week which contained a copy of Fran Connelley’s new book – ‘How To Thrive Under The NDIS’, a guide for CEO’s of disability organisations to flourish under the new NDIS system. How to thrive under the what? I hear you ask! The NDIS is set to completely reform the disability sector in Australia. The scheme is also designed to give people choice and control over their support and the certainty that they will receive this support over their lifetime. The other focus is on early intervention recognising that getting support in early can reduce the impact of disability people and their families. We were asked to contribute to the chapter on collaboration, along with Carol Smail (of Gig Buddies Sydney and ACL Disability Services) and Robin Way of Community Connections. “Fran Connelley’s book is a must read ‘thrival guide’ for Board members, CEOs, executives and managers of disability organisations in Australia right now. It puts the case persuasively for why it is not only possible to be both ‘market driven’ and ‘mission driven’, but that it is the person-centred, absolutely correct AND essential thing to do. And it provides a highly practical, step by step guide for how to do it.” – Roger West, Director & Principal Consultant, Westwood Spice. This book will mostly be of interest to people in Australia as the intention is to support CEOs of disability service organisations to achieve financial sustainability whilst also delivering innovative best practice services that meet the needs of people with disabilities.